Costa Cruise Lines Salami Salad is an easy to prepare salad that your meat lovers will want to enjoy. Recently my good friends Denise and Lee went on a cruise and brought this dish back with them. This salad is so simple to make, but it tastes incredibly good, and with any good salad it gets even better on the second day. This salad has salami, good quality pickles onions, and a bit of olive oil to work this magic. So if you can chop and stir you can prepare this salad. Lee suggests you use good quality pickles such as Claussen because the pickles will really make this salad extra good. This salami salad is perfect for those who follow low carb diets. 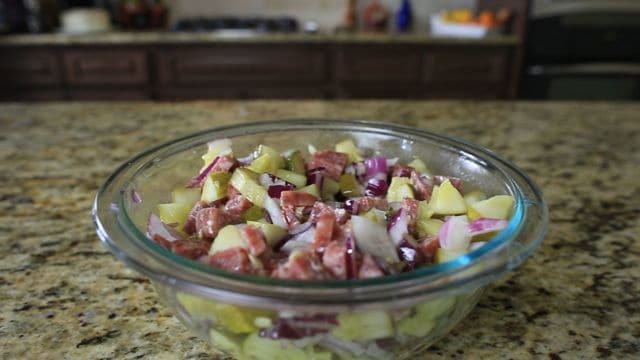 Pickles, onions, and salami make for a great meat salad. In a large bowl add chopped salami, pickles, and onions. Drizzle 2 tablespoons of vegetable oil over the salami, pickles, and onions and stir to blend. Cover bowl and refrigerate for 2 to 3 hours before serving. Ideally this recipe will taste better the second day. You do not need to drain the pickles. When you say pickles, which kind? Bread and butter, dill, garlic dill? Sorry, have never had this. But, will definitely be trying it. Thanks! 1 16 ounce jar Dill pickles (Claussen is recommended). When you go to the store buy the ones that say dill pickle! I’ve never been on this cruise line & not a fan of salami…but the combination of a few simple ingredients makes me want to try it. Someone must love it or Steph would not have published. Let’s hear from someone who has actually eaten this salad, please. I have tried this recipe, it was good. It was brought to a party at my house. It was surprisingly good.